Exeter's hopes of making the League Two play-offs were kept alive as they won at Crawley Town. 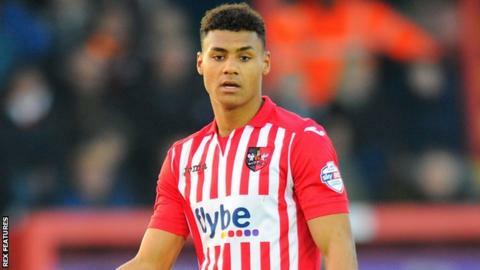 Jake Taylor and Lee Holmes went close for Exeter early on before Taylor was set-up by young striker Ollie Watkins for his second goal in three games. Exeter's Bobby Olejnik saved well from Liam McAlinden soon after the break while Shamir Fenelon and Sonny Bradley were also denied by the Austrian. But Watkins got his fourth goal in six games to seal the win late on. The 20-year-old powerfully headed in Taylor's cross as Exeter moved up to 11th place - five points off the play-offs - while Crawley stay 16th. "I think they showed what a good side they were, particularly in the first half, and we didn't set out not to make tackles or not to stay with runners. "But I felt the goal was coming, as did the crowd by the sounds of it, we didn't take enough warning from it and we didn't stay with our men properly. "We watched them and without Matt Harrold in the team we just felt we needed to be a little more solid in the middle of the park. I thought we gave them a right game and their keeper made four or five really good saves." Match ends, Crawley Town 0, Exeter City 2. Second Half ends, Crawley Town 0, Exeter City 2. Corner, Exeter City. Conceded by Joe McNerney. Attempt blocked. Jayden Stockley (Exeter City) right footed shot from outside the box is blocked. Attempt missed. Shamir Fenelon (Crawley Town) right footed shot from the centre of the box is close, but misses to the left. Andy Bond (Crawley Town) wins a free kick on the left wing. Substitution, Exeter City. Joel Grant replaces Ollie Watkins. Substitution, Exeter City. David Wheeler replaces Jake Taylor. Corner, Crawley Town. Conceded by Troy Brown. Corner, Crawley Town. Conceded by Jamie McAllister. Attempt blocked. Sonny Bradley (Crawley Town) right footed shot from the centre of the box is blocked. Liam McAlinden went off injured after Crawley Town had used all subs. Liam McAlinden (Crawley Town) wins a free kick in the defensive half. Foul by Ryan Harley (Exeter City). Foul by Frankie Sutherland (Crawley Town). Corner, Crawley Town. Conceded by Robert Olejnik. Jake Taylor (Exeter City) is shown the yellow card for a bad foul. Substitution, Crawley Town. Joe McNerney replaces Jon Ashton. Corner, Crawley Town. Conceded by Lee Holmes. Goal! Crawley Town 0, Exeter City 2. Ollie Watkins (Exeter City) header from very close range to the top left corner. Assisted by Jake Taylor. Jayden Stockley (Exeter City) wins a free kick in the attacking half. Corner, Crawley Town. Conceded by Christian Ribeiro. Attempt saved. Sonny Bradley (Crawley Town) header from the centre of the box is saved in the top centre of the goal. Attempt saved. Gwion Edwards (Crawley Town) right footed shot from outside the box is saved in the bottom right corner. Substitution, Crawley Town. Roarie Deacon replaces Simon Walton. Arron Davies (Exeter City) wins a free kick in the defensive half. Attempt missed. Simon Walton (Crawley Town) left footed shot from outside the box misses to the left. Attempt saved. Shamir Fenelon (Crawley Town) right footed shot from outside the box is saved in the bottom right corner. Attempt saved. Ollie Watkins (Exeter City) header from the centre of the box is saved in the top centre of the goal. Foul by Charles Dunne (Crawley Town).